After the nut was opened using a dremel tool and grinding disk, the walnut was photographed with 2 x DSLR cameras with different macro lenses. 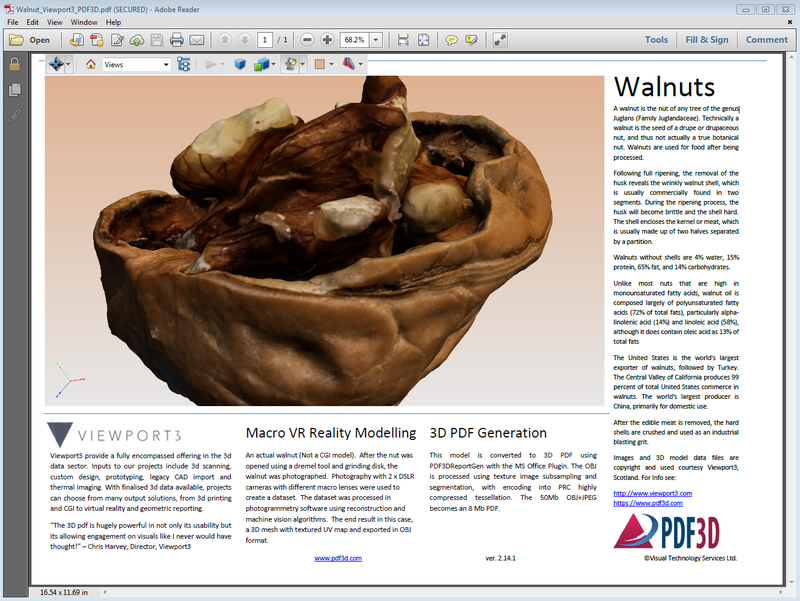 The images were then processed using advanced photogrammetry using reconstruction and machine vision algorithms to build a 3D mesh model representation of the walnut. The end result of this processing is a texture-mapped 3D mesh in OBJ format. Using PDF3DReportGen with the MS Office Plugin, the OBJ was processed using texture image subsampling and segmentation, and encoded with PRC highly compressed tessellation, turning it into a rich 3D PDF. The PDF conversion and consequent compression resulted in a significant reduction in file size, from a 50Mb OBJ+JPG to an 8 Mb PDF, whilst preserving the image quality. This made it easier for the image to be shared and communicated, boosting engagement in the process. Images and 3D model data files are copyright and used courtesy Viewport3, Scotland. Viewport3 provide a fully encompassed offering in the 3d data sector. Inputs to our projects include 3d scanning, custom design, prototyping, legacy CAD import and thermal imaging. With finalised 3d data available, projects can choose from many output solutions, from 3d printing and CGI to virtual reality and geometric reporting.